Life at court often involved long hours of waiting. Courtiers were wealthy lords and ladies that were obliged by law to spend a certain portion of each year serving the Crown. The work was not hard, usually it meant being a companion to the King or Queen or waiting until they were needed. That meant that all courtiers needed to know how to entertain themselves and the Royals with games, stories, and other pastimes. note of authenticity as well as a bit more difficulty. Games of all sorts were played at court. Games we now consider children's games like Blind Man's Bluff or Duck Duck Goose, were played by adults in full attire. Young men also played violent games of football, hurly (similar to field hockey), and Red Rover. But the most popular games for the refined courtier were board games, dice, and after 1371, cards. Both dice and cards were easy to carry in a pouch, could be played anywhere, even without a table. Gambling was usually involved whenever people got together to play games. Most of what we know about the early history of games comes from sermons railing against gambling. But even before cards were mentioned in sermons or literature they appeared in pictures. Contrary to what you would imagine, there is no evidence that Tarot decks were used before 1700 for fortune-telling, though there is ample evidence that they were used for gaming. 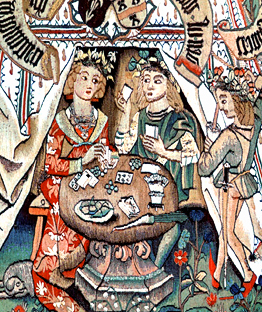 The first decks of Tarot appeared in Italy in 1440, according to www.PlayingCards.US. The first solid reference to Tarot being used for anything other than card games was in 1750. Period card games can be played with the Minor Arcana (Latin style suit cards) of a regular tarot deck by removing the knights to make a 52 card deck. The suits of spades, hearts, clubs, and diamonds are refered to as a French deck. But other combinations of suits have been popular at different times in different regions. In Italy and Spain they used Latin decks with suits of swords, batons, cups, and coins, while in Germany hearts, bells, oak leaves, and acorns were most common. 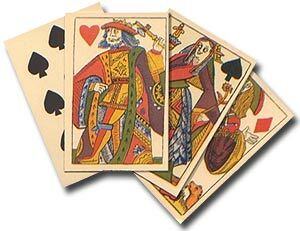 In the 16th century all the face cards had names and they were printed on the cards so we know what they were called. For a chart of names visit Wikipedia. One of the oldest card games played at court was a game called Piquet (pee-KAY) or Picket which is named after the long spears used by French and English soldiers in the 100 Years War in the 14th–15th century. It was also called Cent in England since the goal was to be the player first to go above 100 points. It was described in Girolamo Cardano's Liber de Ludo Aleae (Book on Games of Chance, 1564) and called an ancient game even then. The game is still played in France and the rules have changed very little over the years. (See the references at the end of this article for modern rules) Play is divided into five stages similar to the stages of battle—forces are marshalled, the archers fire, the cavalry charges, the pikemen attack, then the foot soldiers fight one-on-one. The oldest form of Piquet is played with a deck of 36 cards. Before you begin play remove the 2s, 3s, 4s, and 5s of each suit. This differs from the modern version where you also remove the 6s. According to Gretchen Miller's translation, the historical game of Piquet is played by two players called the dealer (or younger) and the elder. Their roles are chosen by a cut of the deck before dealing each hand. The low card becomes the dealer and she shuffles and the elder cuts the deck. The dealer then deals both player 12 cards. Accourding Justin du Coeur's translation dealing should always be done in two, threes, or fours, not one at a time. The remaining 12 cards are spread face down on the table and are called the stock. 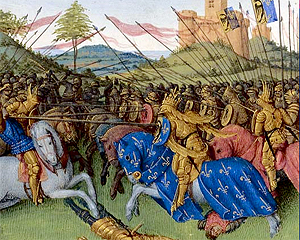 The play consists of five stages of battle. The first four are called the declarations and the last is called Tricks. Points are awarded in each phase so you may need a tally sheet or a cribbage board to keep score. Experienced players forego tally sheets or boards. They keep score verbally before each exchange, as in tennis. If a player forgets to take a bonus when calculating his or her score, it cannot be claimed later, so players can lose earned advantages by not paying attention. The first declaration is called Carte Blanc (white card) where the opponents see if their "armies" have commanders. The elder begins by declaring whether or not he has carte blanc, meaning he has no face cards (J, Q, or K), and how many cards he intends to draw. If declaring carte blanc he shows his entire hand to the dealer. The elder gets 10 points for the carte blanc. The dealer can prevent the points from being awarded (saying, "No good") only if she has carte blanc, too. The dealer then shows her handand play continues to the discard phase. Otherwise, each player, beginning with the elder, can discard and draw up to 8 cards from the stock. Each player must discard and draw at least one card during discards. The dealer is allowed to turn the stock cards face up on the table if any are left but not the discards. The dealer then moves the stock and the discards to the side. The players calculate which suit is strongest in their respective hands. This is called the ruff. The ace is worth 11, face cards are 10, and the rest (the pips) are valued based on their number. The elder begins by declaring the value his ruff. He doesn't have to reveal the name of the suit. If the dealer can meet or better the elder, she says, "No good," and declares the value of her ruff. If they tie, then no one wins and no points are awarded at this stage. Otherwise, she says, "Good." Whoever wins gets one point for every ten in the winning ruff. If it isn't evenly divisible by 10, the winner rounds the remainder of 1 to 4 down to 0, or 5 to 9 up to one point and adds it to the running tally. The loser may ask to see the winning sequence by saying, "Show me." A sequence is a run of 3 or more in one suit. The elder declares the number of cards in his longest sequence by saying tierce (for 3 card runs), quart (for 4), quint (for 5), sixism (for 6), etc. If the dealer can meet or better that number she declares it. If their sequences are the same length then the player with the high card in the sequence wins. If they both have the same high card, no points are awarded. The winner gets 1 point for each card in his or her winning sequence plus a 10 point bonus if the run is 5 or longer. The loser may ask to see the winning sequence by saying, "Show me." from a late 15th century. tapestry. Only sets of 3 or 4 cards (tierce or quart) of matching rank cards of 10 pips or higher count in this stage (3 kings, 4 tens, etc). The elder begins by declaring the rank of his highest quart or lacking that, his highest tierce. If the dealer can beat the elder, she says, "No good," and declares her highest set. Whoever wins the sets gets 14 points for each quart in his or her hand (not just the one used in the declaration) and 3 points for each tierce while laying down the sets as proof. Tricks are played like no-trump tricks in Bridge. On the first trick, the players declare their respective scores starting with the elder. Then the elder leads and the dealer must play a card of the same suit or forfeit the trick. The card with the highest rank of the lead suit wins the trick. The winner of the trick gathers the two cards from the playing area, declares revised score, and leads the next trick. So forth and so on until all the cards are played. The interpretations of how to score the tricks varies slightly but for the most part it boils down to one point for each trick won plus a bonus of 10 points for taking 7 or more tricks. If one player takes all 12 tricks, that is called a capet and the player gets a bonus of 30 points more. In addition, the winner of trick get one more bonus point for each card of 10 or higher in a trick. An alternate translation says one bonus point goes to the player that leads with a 10 or higher even if they don't win the trick. This would make it nearly impossible to score a piquet. If at any time in the game a player has scored 30 points before the other player has scored any, the prevailing player is entitled to a piquet or bonus of 30 more points and must call out "Piquet!" before anything else. If that player managed to score those 30 points during the declarations then he or she is entitled to a repiquet or additional 30 more points on top of piquet. However, this player must immediately call out "Piquet and Repiquet!" when reaching that bonus level, or else forfeit the right to receive the bonus! If neither has more than 100 points at the end of the tricks, then another hand is dealt and play continues from the top. If you want to add this article to your list of favorites or email it to a friend, please use this permanent URL, https://stores.renstore.com/-strse-template/0904A/Page.bok. Permission is granted by the author to quote from this page or use it in handouts as long as you include a link back to Renstore.com.